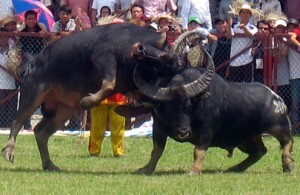 The 20 12 Do Son Buffalo Fighting Festival, often took place in Do Son district of the northern port city of Hai Phong, has attracted over 30,000 local people and tourists. This year’s festival saw competitions among 16 buffaloes selected from qualifying rounds at ward and district levels. After 15 matches with impressive performances, buffalo No. 25 from Van Son ward became the champion. Buffalo No. 01 from Minh Duc ward came in second and buffalo No. 11 from Van Huong ward, third. Both the winners and losers are then killed to worship the God and their meat is equally divided to everybody. The traditional festival, which is held annually on the ninth day of the eighth lunar month, demonstrates the martial spirit of people. It helps promote the locality’s images and tourism potential. Legends say that a long time ago, there was a severe drought. All creatures looked toward the sea, praying for the Creator’s favour. In the most miserable moment, suddenly, they saw two buffalos fighting fiercely on the wave crests and the rains started to pour down, reviving all creatures. People, therefore, organise the fighting performance annually to show their great gratitude to the Buffalo.